NAIS is fully funded by the Central Government. 50% of the premium amount is paid by Central goverment for Small (A cultivator with a land holding of 2 hectare or less (5 acres).) and marginal farmers (A cultivator with a land holding of 1 hectare or less (2.5 acres).). The scheme is implemented at district level. 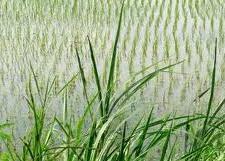 The NAIS scheme, which is currently under operation in 25 states and 2 Union Territories, is being implemented in the country since the 1999-2000 Rabi crop year. The implementation is done by Agriculture Insurance Company of India (AIC). 1. To provide insurance coverage and financial support to the farmers in the event of failure of any of the notified crop as a result of natural calamities, pests & diseases. 2. To encourage the farmers to adopt progressive farming practices, high value in-puts and higher technology in Agriculture. 3. To help stabilise farm incomes, particularly in disaster years. c. Sugarcane, Cotton & Potato (Annual Commercial / Annual Horticultural crops). a) On a compulsory basis: All farmers growing notified crops and availing Seasonal Agricultural Operations (SAO) loans from Financial Institutions i.e. Loanee farmers. b) On a voluntary basis: All other farmers growing notified crops (i.e. Non-Loanee farmers) who opt for the Scheme. 2) Storm, Hailstorm, Cyclone, Typhoon, Tempest, Hurricane, Tornado etc. Losses arising out of war & nuclear risks, malicious damage & other preventable risks shall be excluded. The sum insured (SI) may extend to the value of the threshold yield of the insured crop at the option of insured farmers. However, a farmer may also insure his crop beyond value of thres hold yield level up to 150% of average yield of notified area on payment of premium at commercial rates. In case of Loanee farmers the Sum Insured would be atleast equal to the amount of crop loan advanced. The government has also implemented a Modified National Agricultural Insurance Scheme (MNAIS) on a pilot basis in 50 districts from the 2010-11 Rabi crop year in the country to check the shortcomings in the NAIS. A major improvement made in the MNAIS is that the unit area of insurance has been reduced to the village panchayat level for main crops.Under the MNAIS, the central and state governments share the premium subsidy on a 50:50 basis and claims are the liability of the insurance companies.